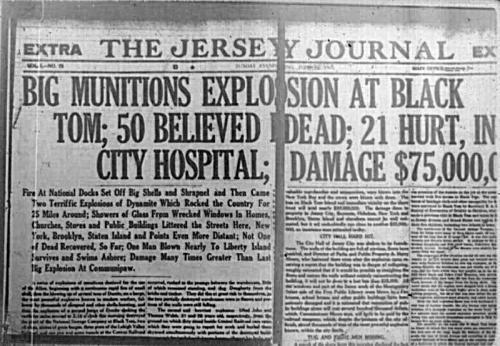 This July, the Yale Law Library presents “Explosion at Black Tom: A forgotten history of sabotage during WWI”, an exhibit dedicated to the one hundred year anniversary of the Black Tom Island munitions depot explosion in Jersey City, New Jersey. On July 29, 1916, German agents set fire to a complex of warehouses and piers in New York Harbor that held munitions, fuel, and explosives bound to aid the Allies in their fight in Europe. However, Black Tom was not the first act of sabotage, but just one in a series of many across the country in the years leading up to US entry into WWI. The Black Tom explosion was a peak act of German sabotage on American soil during the first World War. The exhibit is divided into two sections presenting historical and judicial points of view. It showcases literature related to the incident, numerous photographs and pictures, and original legal documents pertaining to war reparations for damage from the Black Tom explosion from our library collection. The Detonators: the secret plot to destroy America and an epic hunt for justice by Chad Millman. Sabotage at Black Tom: imperial Germany’s secret war in America, 1914-1917 by Jules Witcover. The United States on behalf of the Lehigh Valley Railroad Company vs. the German government: The United States on behalf of agency of Canadian Car and Foundry Company, ltd. vs the German government: the United States on behalf of the Underwriters Committee on the Black Tom explosion vs. the German government. The United States on behalf of Lehigh Valley Railroad and Black Tom underwriters and agency of Canadian Car & Foundry Company, Ltd., and Kingsland underwriters against Germany [electronic resource] : docket nos. 8103, 8117, et al., and 8117, et al. : supplemental petition for rehearing.